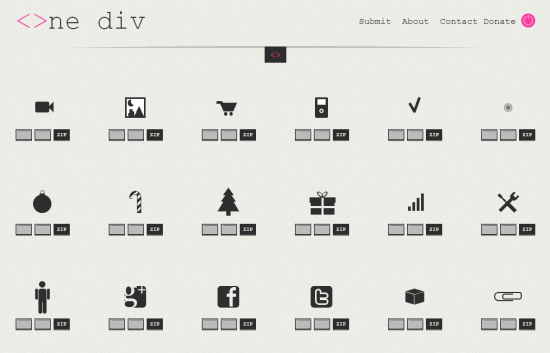 The site One-div.com basically is a gallery of icons realised in pure CSS3. Most of the symbols are typical for frequently needed UI elements, such as connections to social networks or the visualization of different media. As they are pure CSS they only contain one color and are all in all fairly simply designed. Each icon is equipped with three buttons. Clicking these provides you with the HTML code, the CSS source and has it copied to the clipboard automatically. The third button lets you download a package consisting of all the needed sources ready to implement. Hovering over the icons you can check which browsers will show the icon flawlessly, which ones will have issues and which ones will not be able to display it at all. This information is available for Chrome, Firefox, Safari, Opera and Internet Exploder. The creators of the service work hard to ensure compatibilty with Chrome, Safari and Firefox at least. At the time of this writing we can make use of around 80 icons in the gallery. As anyone – after registration – can contribute to the service, we might probably see a lot more icons in the near future. The big advantage compared to icon fonts or SVG is the possibility to animate the icons using hover effects through transition properties or putting together a full-fledged keyframe animation via the animation property. The gallery already contains a few animated icons. If you know your ways around CSS you can inject motion into any of the provided icons fairly easily. Just toy around with pseudo elements such as before and after in conjunction with css3 transitions and you should be good to go. Conclusion: One-div.com sure has some useful icons in store, but the best part to the service is the inspiration it offers for your own efforts in creating icons using pure CSS3. Go for it! Okay this is seriously interesting! It’s ready made code that can be used anywhere to create good looking icons. No cost too, that makes it even more better than anything else. Class. The day we get away from themes loaded with images the better!! !